As President Obama tries to sell the world his mysterious nuclear “framework agreement,” India’s defense establishment is just not buying it. The U.S. and Western commentators might be expecting “peace dividends” from Iran, but India cannot afford to harbor such illusions. The Iranians have already announced that they plan to sell “enriched uranium” in the international marketplace, and will be “hopefully making some money” from it. To whom will they sell? A nuclear Iran would be able to hold the world hostage by blocking one-third of the world’s oil supply at the Strait of Hormuz. Iranian proxies have also been trying to seize control of the Bab-el-Mandeb Strait, the maritime choke point of the Suez Canal. The only question is whether the West would rather have an adversary such as Iran before it has nuclear weapons or after. India’s foreign office might have joined the international chorus welcoming the deal, but as U.S. President Barack Obama aggressively tries to sell the world his mysterious nuclear “framework,” India’s defense establishment is just not buying it. One day after the P5+1’s mysterious “agreement” with Iran, India began gearing up for a more effective nuclear defense, and unveiled plans to equip the country’s capital, New Delhi, with a comprehensive missile defense shield to avert a nuclear attack. Once in place, the shield could intercept missiles fired from a range of 5,000 km, roughly double the aerial distance between New Delhi and Tehran. The first step would be to install the long-range “Swordfish” radars, developed with the help of Israel. They can track missiles from a range of 800 km. India’s missile interceptor capability is expected to be functional by 2016. India also plans to set up a missile shield for its commercial capital, Mumbai. 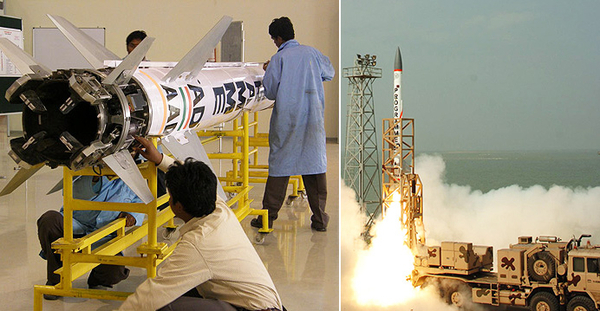 At left, Indian defense contractors work on an Advanced Air Defence (AAD) interceptor missile. At right, an Indian AAD missile is test-launched. On April 4, India’s Defence Research and Development Organisation (DRDO) also reiterated the country’s ability to hit targets well beyond its adjoining region. India has always been seriously concerned about prospect of nuclear proliferation in the Middle East. If Arab and Muslim countries decide to counter the Iranian nuclear threat with nuclear arsenal of their own, India’s hostile neighbor, Pakistan, is likely to want to play a crucial role. India is not only vulnerable to nuclear threats from Pakistan. Both the Islamic State (ISIS) and Al-Qaeda have also openly declared hostility toward it. India has long been concerned about nuclear capabilities or materiel falling into the hands of Islamists in Pakistan. By now, it is no secret that if Iran acquires nuclear weapons capability, nuclear proliferation in the Middle East will increase exponentially. The Iranians have already announced that they plan to sell “enriched uranium” in the international marketplace and will be “hopefully making some money” from it. To whom will they sell? President Obama and Western commentators might be expecting “peace dividends” from this “historic reconciliation” and be awaiting all sorts of positive “spillover effects” as a result of lifting sanctions — from changing Iran’s attitude towards Israel to democratizing the Iranian regime — but India cannot afford to harbor such illusions. Islamist terror has claimed more than 30,000 Indian lives in just the last two decades. Indians are now bracing for the real spillover effects of a nuclear Iran. Thanks to Washington’s indifference, Iran now controls four Arab capitals — Damascus, Baghdad, Beirut, and now Sana’a, while the U.S. has retreated from three: in Libya, Yemen and Iraq. If Iran can hold the Obama administration hostage without any leverage, a nuclear Iran would be able to hold the whole world hostage by blocking one-third of the world’s oil supply at the Strait of Hormuz — with impunity. Iranian proxies have also been trying to seize control of the Bab-el-Mandeb Strait, the maritime choke point of the Suez Canal. European leaders who failed to show any resoluteness in face of Russian aggression against Ukraine, and even failed to vote against a “framework” that threatens global security, can hardly be expected to stand up to Tehran. The only question is whether the West would rather have an adversary such as Iran before it has nuclear weapons or after. Once major European powers such as Russia, France and Germany start investing in Iranian infrastructure and entangling themselves with Iran economically, one can forget about rolling back sanctions. Western leaders can spin the “framework” agreement all they want to cover up their abysmal diplomatic failure, but as Tehran’s centrifuges keep spinning as a result of the deal, the region turns more and more volatile. Regardless of the diplomatic chorus and the media circus, the defense planers in New Delhi are just not buying this agreement. Other countries that care about the free world would be wise not to buy it, too. This entry was posted on April 14, 2015 at 6:05 PM and is filed under Diplomacy, Economy, Foreign policy, India, International Community, Iran, Iran scam, Iranian missiles, Iranian nukes, Iranian proxies, Nukes, Obama, Oil, P5+1, Sanctions. You can subscribe via RSS 2.0 feed to this post's comments.